Parents are taught to always give consequences promptly for their child's misbehavior. That is they seek a suitable punishment in order to teach a lesson. We need to rethink this well-known principle. How can you find the right punishment if you don't actually understand the behavior? That's the puzzle! With Parental Intelligence you don't jump to consequences such as punishment off the bat because first you need to comprehend what the message is that the behavior is sending. The main idea is that behavior is a form of communication when words can't be found or don't suffice. It's the parent's job to decipher the message, then they know what to do next. 1. Step Back and try not to be nonjudgmental about the puzzling misbehavior. Consider that your child is distressed, not bad. This can surely change your outlook. Think about when your child demonstrates the misbehavior. Track it and see if you begin to see a pattern that makes some sense, even though it's distressing to observe. 2. Self-reflect about the feelings the behavior brings out in you before you act on them by yelling, for example, or lecturing to no avail. 3. Consider your child's stage of development. Is his behavior just the result of immature thinking that is to be expected at this stage? 4. Now comes the crux of the matter -- what is on his mind? Begin to ask yourself what the behavior means. You can become a meaning-maker figuring out what your child's actions intended to communicate. 5. Thinking about behavior as an invitation to understanding and a communication when words don't suffice, changes the whole view of punishment as a solution. Now that you understand the meaning behind the behavior you can problem solve with your child. Let's say your two-year-old has a series of long temper tantrums at day care. After trying the steps of Parental Intelligence, you find out he has a deep loss of his nanny who left him when he was 18 months, he's overheard his father talking about leaving his mother, and he misses his mother when she goes to work and leaves him at daycare which is where he tantrums. This isn't a 'bad' child. This is a deeply distressed child whose tantrums show the multitude of feelings jumbled inside of him. His external behavior -- the tantrums -- demonstrate his internal behavior -- loss and bereavement. Punishment, yelling at him, standing him in a corner, putting him alone in his room -- all would escalate the problem by leaving him feeling even more abandoned. The complexity of a misbehavior starts to become clear and punishment becomes obviously outside the scope of the problem. Using Parental Intelligence, parents become meaning-makers. They make sense of the puzzling behaviors that call out to be understood. Older children can collaborate and explain their intentions, ideas, opinions, and be heard explaining the reasons for their actions. Parents can learn to read nonverbal as well as verbal communication and thus open dialogue begins! 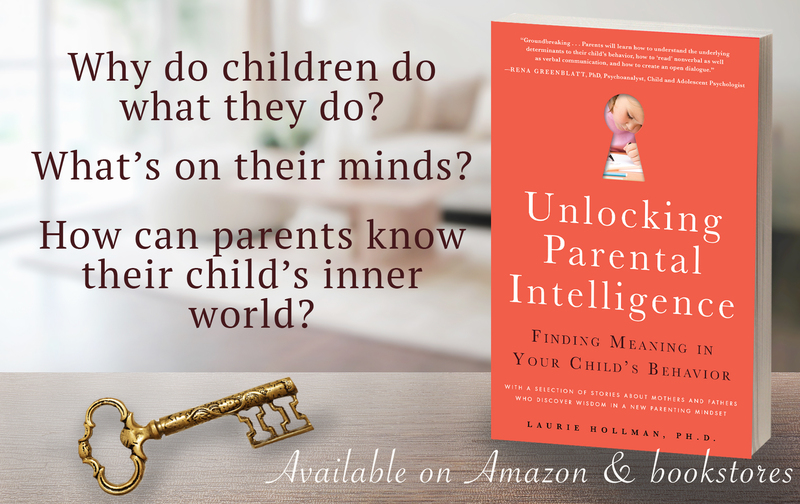 Laurie Hollman, Ph.D. is a psychoanalyst with a recent book, Unlocking Parental Intelligence: Finding Meaning in Your Child's Behavior, found on Amazon, Barnes & Noble, Familius, and wherever books are sold.